Introducing the latest venture from the mavericks behind the Mid-Missouri Micro soccer league and the Ravens Futsal Melee tournament….Cleats & Beats. This is a one day 4v4 soccer tournament and music festival, with some of the best artists in the area. Come for the soccer, stay for the music! 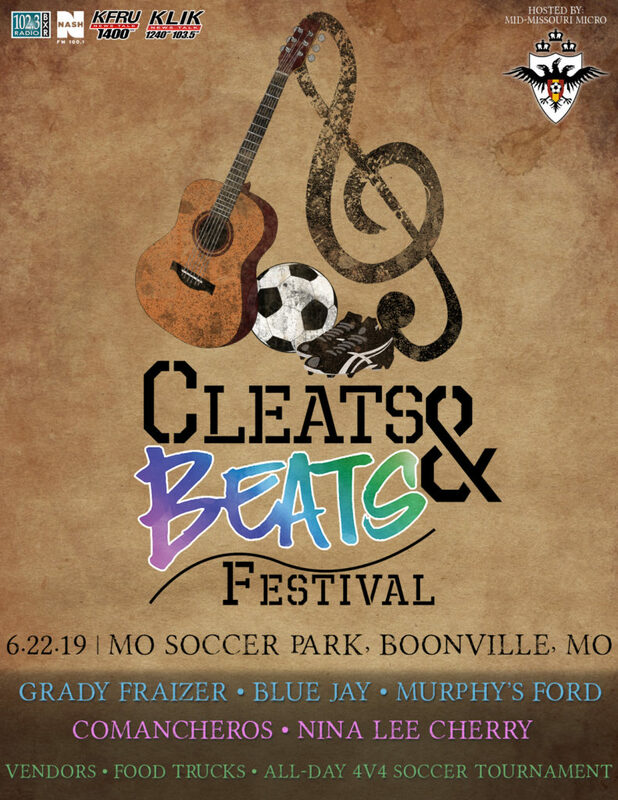 Mark your calendars for June 22, 2019, and plan to spend the day at the Missouri Soccer Park in Boonville, Missouri! All games will be played Saturday, June 22. The format is 4v4, no keeper, with a maximum roster of 8 players per team. This is for youth teams U10-U19 (boys and girls) along with an under 30 and over 30 adult coed division. Coed divisions must have two females on the field at all times. Registration fees per team are: $275 for U10-U14; $285 for U15-U19; $295 for adults. Price includes passes for rostered players (up to 8) and one coach. Admission fees for fans: $25 for adults and ages 15+ ($30 after June 9); $15 for youth ages 7-14 ($20 after June 9); children age 6 and under are free. Tickets must be shown at gate. Buy in advance for early bird prices!